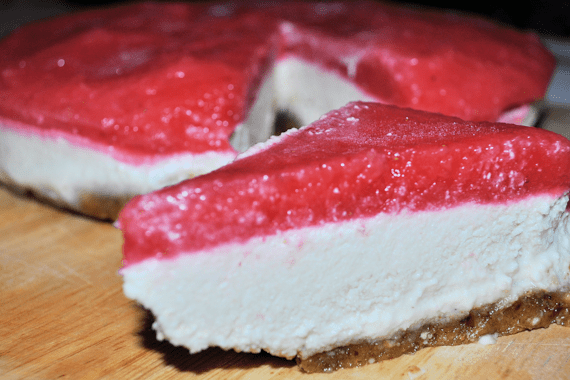 Was raw food cheesecake a sensible idea? I’m not really sure to be honest. I’m glad I made it, but a very small slice is enough to eat. I loved the base and the topping, but I can’t say the same for the filling. None of the kids liked it, but they are more used to dairy. I do think that if I’d used a dairy filling, they’d really have liked it. With this size of cheesecake, you could easily get about 15 – 20 small portions. Looks pretty easyish to make, but a bit disappointing for us. I’d say that you would have to be a die-hard vegan / vegetarian to go for this a lot, and the calories must be immense, but it does make a dessert for people who might not otherwise be able to have one. Adding some more tartness to the filling might have made it a bigger hit here, but I’m not sure I would ever try it again. Put walnuts and dates into a food processor. I have to use my steel blade to get this to work and it can take several minutes to get the base to a place where it looks and feels like a cheesecake base. You can keep it with big chunks or wait a little longer to have a more finely processed base. I added a little agave syrup to help blend the nuts, but it really wasn't needed. Sprinkle the coconut onto the pan you'll use for your cheesecake to set in. It makes the first layer to stop your cheesecake from sticking. Press the walnut mix down on top of the coconut and your base is ready for the filling. Put all the filling ingredients, apart from the water into a mixer / processer at the same time. You can add water bit by bit, and keep processing until you have a smooth creamy mix. It may take a few minutes to happen. Put filling on top of the base and freeze it for about an hour to let it harden. At this point, it really is looking like a regular dairy cheesecake. Blend the strawberries until they are smooth. Put them on top of the base and filling. Put it all back in the freezer until the topping slightly hardens. Then all you have to do, is remove from freezer and serve immediately. The coconut oil is to help the filling stay in shape. Coconut oil that is solid at room temperature works well. If you leave out the coconut oil, you may have to add in some gelatine to keep it in shape, or serve straight from the freezer instead. You can also use gelatine for the topping of strawberries to allow it to set without using the freezer. « Just how much does “free” state school at point of entry cost? Not sure it’s totally my bag but the topping does look yummy. Would a soy based cream cheese or yoghurt work better in the filling do you think to add that creaminess and slight tang?